As MI6 reported back in July, Coca-Cola has renewed a deal with the 007 producers to market Coke Zero in conjunction with the forthcoming 23rd James Bond adventure, "Skyfall". The details of the deal were kept strictly under wraps, and the company were keeping tight lipped about what form the marketing campaign would take. Now we know that Bond will continue his partnership with Coke Zero, a relationship that began with the release of "Quantum of Solace" in 2008. 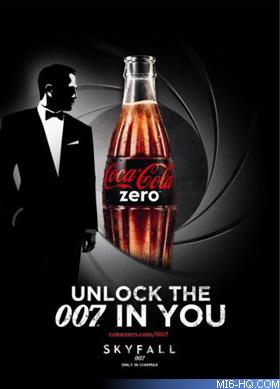 This new campaign will use the tagline: "Unlock the 007 In You." "Skyfall is without a doubt one of this year's most anticipated film releases, and we are very excited to be a part of it and to continue our relationship with the world's favourite movie franchise," said Zoe Howorth, Coca-Cola's UK Marketing Director. "James Bond is a global cultural icon who consistently takes action to create what's possible, making this the perfect partnership for Coca-Cola Zero," she continued. The new Coke Zero design will be pressed into service on PET bottles and special aluminium bottles. In addition, the branding will be used in TV, Cinema, and outdoor advertising. Right: First branding for Coke Zero's 007 tie-in. Jeroen Lampe, Brand Manager at Coca-Cola also commented: "Skyfall is, without doubt, one of this year's most awaited movies and we are thrilled to be part of it. James Bond is a global icon who continuously takes action to make the impossible possible; the perfect partnership for Coca-Cola Zero."